14”x16” Cotton Shopping bag- to be dyed and reused again and again! Kits Created and Packaged in the USA. Professional Quality Beginning Tie-Dye Kit! Have you been disappointed with those “one step” tie dye kits you bought in a retail store? Our dyes and kits give FAR SUPERIOR results to “one step” dye kits. High Quality Reactive dyes are the worlds Best Dyes for Cotton, linen, rayon, hemp, or other plant based fabrics. This kit comes with Easy to Follow Instructions and has enough dye and dye fixer to tie dye a whole bunch of projects! Plus it’s packaged in a Reusable Cotton Shopping bag that we want you to Tie-Dye and use again and again. Kit comes packaged in the bag- we call it "Tie Dye Kit in a Bag"- The first photo shows what comes in the kit. The tie dyed backdrop is just for the photo and not included. Q. “Why don’t you have pre-measured squeeze bottles in your kit? A. We don’t have pre-measured bottles in our kit because we teach you how to mix different colors using different dye concentrations. For example with fuchsia in the kit, you can make a strong red shade, or a nice baby pink, it’s all in how you mix the dye. We give you pipettes (big eye dropper tools) to use to apply the dye to the fabric. These are the tools we use for small scale projects that you will be making with these kits. Pipettes are much easier to use and far more effective at applying dye. A. In reality, this kit contains FAR MORE dye and the fixer chemical (soda ash) you need than other kits available at retail stores. In our estimation at bright shades, this kit will make about 16 t-shirts. 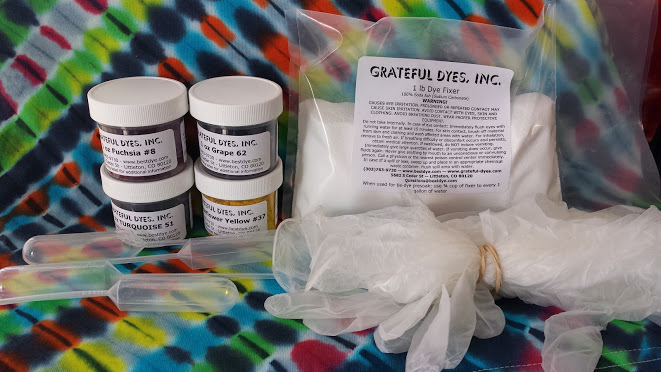 Other kits we've seen say they have “1/3 pound of soda ash“, and can make “up to 15 projects” Our kit contains a full pound of soda ash - 3x’s more than other kits, but since we are tie dye experts, we KNOW that there is NO WAY you can make 15 t-shirts with their 1/3 lb. of soda ash. Since we tell the truth in our advertising, we cant’ compete with their outrageous claims. Just know, our kits contain MUCH more usable product than other similarly advertised kits.